Do you realize how smart you are? Do you realize how smart you are? 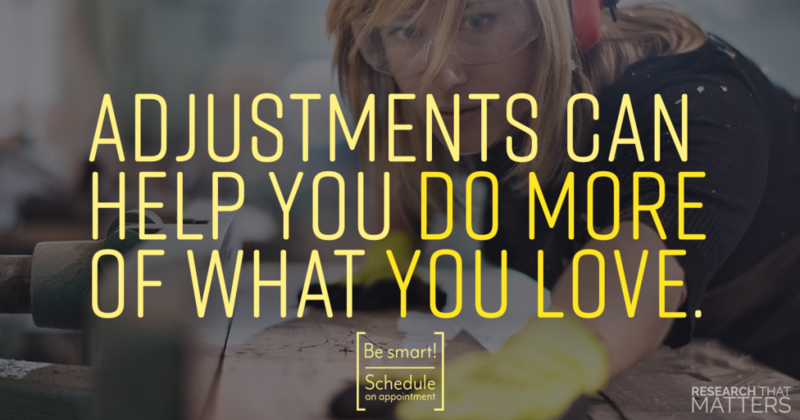 Adjustments can help you do more of what you Love. Bottom Line: In a world of dangerous medications, risky surgeries, and the cost of healthcare being the number one cause of personal bankruptcy, doing what you can to get well soon and stay well for as long as you can is what can we say, simply genius. Many of the most respected healthcare organizations in the world recommend chiropractic care as the best, natural way to stay pain free; but recent research from the top tier research journal SPINE has proven chiropractic to have “statistically and clinically significant” benefits (which is research-talk for the fact that chiropractic care REALLY helps people). Why it Matters: By choosing chiropractic care you have improved your chances of finding relief by over 70%! When someone only utilizes “standard medical care” for acute low back pain, they have about a 17% chance of having moderate improvement or complete recovery. But, when you add chiropractic adjustments the percentage of people who found moderate or complete relief was 73%. Adjustments can help “gate” or reduce pain by affecting specific nerve pathways in your nervous system. When a chiropractic adjustment is given, the body often turns off the pain signals that go to the brain. Not only that, but chiropractic adjustments can also improve our overall function ability. That means you can do more of what you love with less pain. Adjustments can help you do more of what you love. Next Steps: Whether you are a young mom on the go, a senior enjoying a few rounds of golf every couple days, or a road warrior traversing the skies for business; you require a natural way to stay active and healthy. This study gives you the ability to share with others that standard medical care AND chiropractic care is both smart and scientific. Elevation Chiropractic can help you with almost any ailment using an effective gentle and relaxing approach. Call to schedule your appointment today.